Of potential interest – new paper from the Banfield Lab – thanks to Elisabeth Bik for pointing me to this on Twitter. 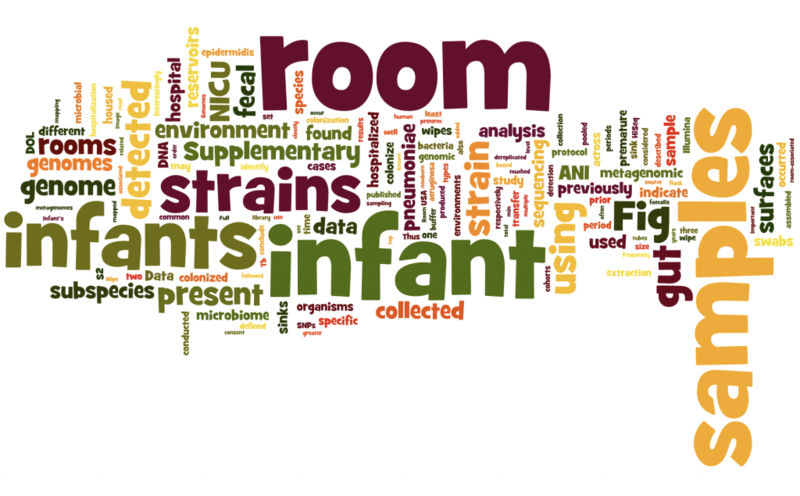 Preterm infants exhibit different microbiome colonization patterns relative to full-term infants, and it is speculated that the hospital room environment may contribute to infant microbiome development. Here, we present a genome-resolved metagenomic study of microbial genotypes from the gastrointestinal tracts of infants and from the neonatal intensive care unit (NICU) room environment. Some strains detected in hospitalized infants also occur in sinks and on surfaces, and belong to species such as Staphylococcus epidermidis, Enterococcus faecalis, Pseudomonas aeruginosa, and Klebsiella pneumoniae, which are frequently implicated in nosocomial infection and preterm infant gut colonization. Of the 15 K. pneumoniae strains detected in the study, four were detected in both infant gut and room samples. Time series experiments showed that nearly all strains associated with infant gut colonization can be detected in the room after, and often before, detection in the gut. Thus, we conclude that a component of premature infant gut colonization is the cycle of microbial exchange between the room and the occupant.